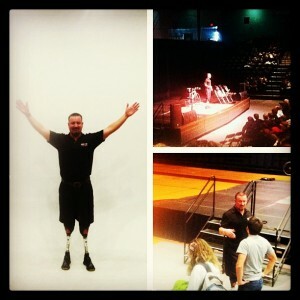 This morning, Grace College, Winona Lake, Ind., hosted world champion Ironman and double amputee, Scott Rigsby, for an inspirational talk to kick off Transition Exploration Day. It was reported in the local online news site, Stacey Page Online. A portion appears below. Click here for the complete story. Scott Rigsby, world champion Ironman and double amputee, gave an inspirational speech to kick off Transition Exploration Day held at Grace College today. Rigsby spoke to the Grace College student body and special guests about the importance of seeing each individual’s purpose as a part of God’s bigger plan. “You will give up if your life isn’t a role in a bigger story,” he explained. “You will give up if you’re doing it only for yourself.” He used accounts from his own remarkable life to inspire students to overcome fears and obstacles and make their dreams a reality. Despite the fact that he lost both legs in a collision with a semi when he was 18, Rigsby now holds world records for double below-the-knee amputees in the Full Marathon, Half Ironman and International Distance Triathlon. He was the first double-amputee on prosthetics in the world to finish an Ironman distance triathlon. He is now involved in speaking events around the country and counseling wounded U.S. troops.